The Baby Driver star admitted how a “real argument” erupted when the call back about the Mamma Mia! sequel clashed with an event she was attending with her partner, Matt. In an interview with NET-A-PORTER’s digital magazine, PorterEdit, the 29-year-old revealed how the Glastonbury Festival was the only available weekend to meet with movie bosses. “So it was a real argument!” Lily confessed, however thankfully she did go along and her actor beau, 35, collected her from the read-through in the car. Lily’s agents had previously been reluctant to even pitch the flick, which sees her star alongside the likes of Meryl, 68, Amanda Seyfried, Pierce Brosnan and Colin Firth. “I was like, ‘Are you crazy? I can’t wait. You’ve got me totally wrong here!’” she told them. The blonde beauty went on to talk about how she sparked engagement rumours back in February. 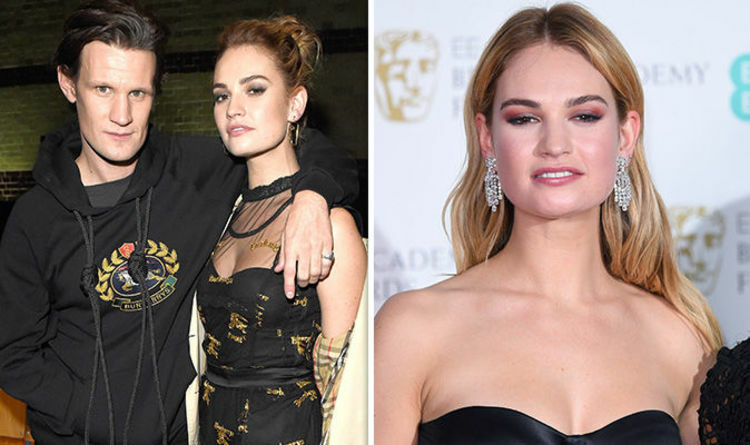 Lily shocked onlookers by wearing a large diamond ring on her engagement finger at the 2018 BAFTA Awards. “I’m just not very superstitious about rings. It’s stupid, probably, but I just put rings on any finger,” she told the publication. Lily also broke he silence after Matt claimed he wanted “lots” of children during a chat on BBC Radio 4’s Desert Island Discs. Exclaiming “no comment”, she stated: “Yeah, a lot of our friends are having kids. Two of my closest girlfriends just had babies and I adore them. Lily posed for the cover where she flashed a hint of bra in a white blazer and matching high-waisted trousers. The Cinderella favourite was also seen reclining on a sofa after teaming her bottoms with a simple vest and trainers. Her comments come just weeks after it was confirmed that Tobias Menzies had been cast as the royal Prince Philip in seasons three and four of The Crown. He will be replacing Matt after his portrayal of the monarch through seasons one and two. Tobias will be fitting filming of the Netflix drama in around his already packed schedule, as he currently holds a strong tenure in a number of TV shows. Most notably, he holds the title of Lord Edmure Tully in Game of Thrones – who has been imprisoned since season four. To see the full interview with Lily James read PorterEdit at www.net-a-porter.com/porter/article-8f833fb522441340 and/or download the Net-A-Porter app for iPhone, iPad and Android. Mamma Mia! Here We Go Again is expected to be released in the UK in June.